|       |   0x08048aa4      c7442404b18d. mov dword [local_4h], str.usage_: ; [0x8048db1:4]=0x67617375 ; "usage : "
|       |   0x08048ac4      c7442404ba8d. mov dword [local_4h], str.password ; [0x8048dba:4]=0x73617020 ; " password"
|      ||   0x08048b9b      c7442404fc8d. mov dword [local_4h], str.Bravo__tu_peux_valider_en_utilisant_ce_mot_de_passe... ; [0x8048dfc:4]=0x76617242 ; "Bravo, tu peux valider en utilisant ce mot de passe..."
|      ||   0x08048bbf      c7442404348e. mov dword [local_4h], str.Congratz._You_can_validate_with_this_password... ; [0x8048e34:4]=0x676e6f43 ; "Congratz. You can validate with this password..."
|     ||`-> 0x08048be5      c7442404658e. mov dword [local_4h], str.Password_incorrect. ; [0x8048e65:4]=0x73736150 ; "Password incorrect." So now, I would like to solve this challenge again in a different way. I have two questions. Why I don't have the rip value ? Can you explain me how can I do that if is it possible ? 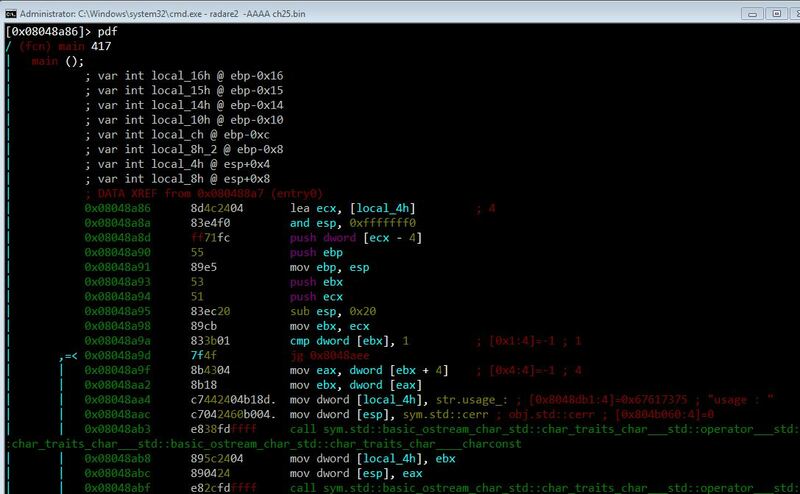 did you analyse the executable prior to loading or after loading it ?